I Can Fix Up My Home | Four Affordable Amenities for a Luxurious Shower | Your bathroom is a large part of your home equity; make it a comfortable and enjoyable space. © 2012 by Alyssa Davis All rights reserved; content may not be copied, rewritten, or republished without authors written permission. Have you ever spent a restorative weekend at a luxurious hotel with a spa bathroom? If so, you likely fell in love with the luxury amenities often found in high end hotel showers. If you are renovating your bathroom or building a new home, keep these four tips in mind so that your shower will be a luxurious as those in your favorite hotels or spas. You wont be disappointed! While less is more applies to many design principles, shower size is not one of them. A bigger shower is always better so that you have plenty of room to turn around, raise your arms to shampoo and bend over to pick up a bar of soap without smacking your head on a faucet. This is particularly true if you are a tall or bigger person. The shower stall should be at least 5 feet by 3 feet; if you plan to add benches or you are remodeling a home for disabled homeowners, even more room will be required. Of course, expanding the size of an existing shower can be expensive, but if you are gutting and renovating the bath room anyway, plan on allowing as much room as possible for a bigger shower because it really wont add more expense to your project. 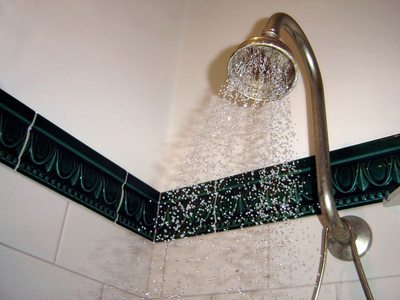 A large shower is an upgrade that will pay you back should you sell your home in the future. So will a built-in bench. Once again, adding this to the design during the building phase really doesnt add any great expense other than a little extra lumber, cement fiber backer board, and tile. However, a bench adds a great deal of luxury to a shower. It provides a place to sit down when bathing or shaving and provides a great looking modern touch perfect for showing off a stack of fluffy towels or a basket of loofahs and scented soaps. Another feature to consider during the building phase: A walk-in, curb-free shower stall so that you don't have to step over a threshold. Not only does this look modern, it also is a great feature as you get older or should you ever need to push a wheelchair into the shower. For just the cost of some extra pipe, you can place the faucets where you can reach them from outside the shower. This convenient feature allows you to turn on the water and warm things up before stepping inside. Speaking of warming things up, a heat lamp in the vicinity of the shower stall is a nice touch. Local electrical codes need to be followed however, so that heat lamps are legally installed according to local electrical building codes. Also take a look at the incredible array of shower heads that are available today: from rain shower heads to waterfalls and multi-directional pulsating heads mounted above or from the side walls, choices are nearly without limits. The only concern is having enough water pressure and hot water; a tankless water heater is another mechanical upgrade that doesnt cost much up front but adds lots of enjoyment for years to come. These are also called on-demand water heaters. One of the prime advantages over traditional tank models is that the water is only heated once  when you want it; thus saving money on utility bills. Shower stalls are often delegated to the dark, back corner of the bathroom; but take some time to add some natural light to the space. 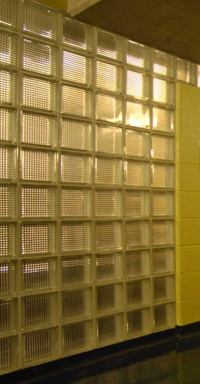 A glass shower door is one option, or add glass block to an outside wall. Dont shy away from glass block out of privacy concerns; although they allow the light to shine through, they will not allow prying eyes to see through. These walls are a good example of a passive solar concept becoming popular in the green and sustainable building community. A skylight is another light touch. Now just hang a gorgeous metal art piece on a focal wall across from the shower so you can enjoy the view while standing under an invigorating stream of water. Learn more about decorating with iron fish art and dolphin metal wall art from our exclusive designer and staff writer, Alyssa Davis, of Metal-Wall-Art.com. Article © 2012 Alyssa Davis; All rights reserved; content may not be copied, rewritten, or republished without authors written permission.